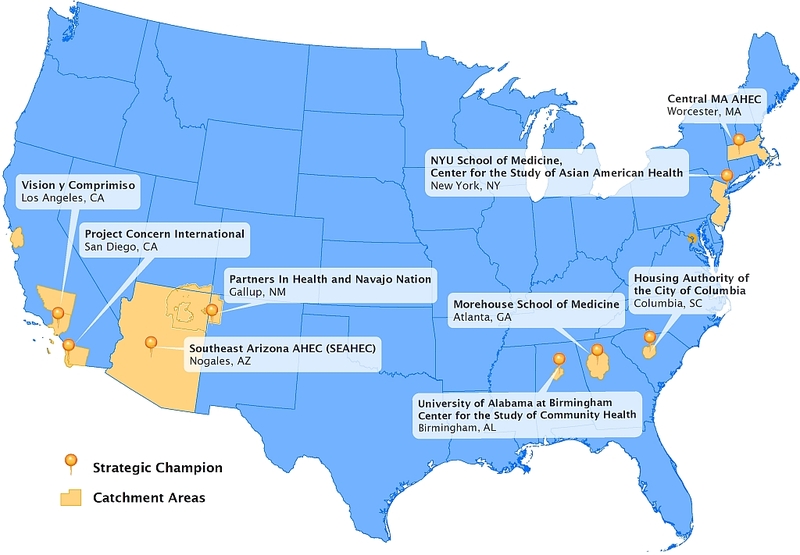 Nine Strategic Champions were funded for 16 months (April 2012-July 2013) to implement a new generation of community health worker (CHW) projects to reduce heart disease risk factors in African American, American Indian, Filipino American, and Hispanic/Latino communities. A map of the projects and their catchment areas is shown below. The Champions were tasked to focus primarily either on building CHW capacity or community education. However, many Champions' projects overlapped, and they addressed both areas. These organizations built their capacity to adapt and implement the Initiative’s heart health curricula and implementation strategies by using innovative education and training approaches in community, clinical, and virtual settings. As a core component of the projects, they established strong community and academic partnerships to sustain their work after NHLBI funding ended, and they conducted individual process and outcome evaluations. The NHLBI also conducted a cross-site process and outcome evaluation to analyze the results observed across all nine projects. Each Strategic Champion developed an evaluation plan that included both process and outcome measures. At the process level, Strategic Champions reported the number of CHWs and community members trained and the types of strategies used for recruitment, retention, and training. The factors that supported and impeded implementation and lessons learned were also described. At the outcome level, the evaluation focused on changes in heart health knowledge, attitudes, and behaviors of CHWs and community members and, when possible, how these changes differed by implementation modality (e.g., virtual versus in person training, number of training sessions, and retention strategies).